salad « Eating for Two, for One. I have a big interview tomorrow! And I bought a tangerine-coloured pencil skirt especially for the occasion. Because I have spent this evening watching law and order SVU, and preparing for whatever they want to throw at me over the first 6 hours of my day tomorrow, I ate takeaway laksa (foodgasm) and came home to sweatpants (almost as good) for a little rest n prep before the big day. Luckily, I knew this day would come. 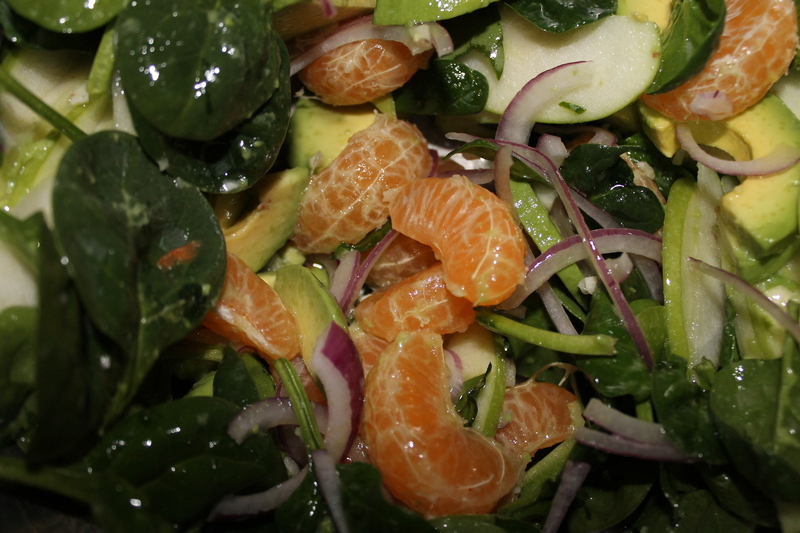 Rather, that the meal I made here was really an ode to oranges – and I also made a salad with beautiful mandarins. I still don’t understand why some people don’t like them. I love them so much, that when I was little I couldn’t wait to eat them by the segment, I used to eat them by the half. One time, I ate the whole damn thing and turned blue and gave my mother a heart attack. I love eating SO MUCH. Half a red onion, sliced thinly. Combine wet ingredients at the bottom of a salad bowl. Whisk together, with approximately 1 garlic clove per 3T oil and 1T vinegar. Add in the rest of the ingredients. Toss, serve, love. With love, from Charlotte – wish me luck! This entry was posted in Uncategorized and tagged apples, avocado, cook, cooking, Eating, food, garlic, Granny Smith, Law & Order: Special Victims Unit, mandarin, Pencil skirt, red onion, salad, Spinach.